Two years have already passed since France started the first preparations for the EURO 2016 European Football Championship. By then seven stadiums had to undergo real major renovations, four new constructions had to be built and only one was already in perfect shape according to the new requirements. Although there is still a lot of work to do, the progress is going well and Euro 16 - which will be held in ten different cities - is reaching beautiful results. Besides Saint-Denis’ Stade de France which was already in good condition and did not require any constructions, two more stadiums in Lille and Nice have been delivered. This leaves us with seven more stadiums that need to be renovated. Following an overview of these stadiums and in which stage of the project they find themselves. Lyon - The construction of the new stadium ‘Stade des Lumières’ has encountered some difficulties, including the opposition of some residents’ associations fearing too much noise for their guests from the stadium, just finished the earthworks. The opening is expected to be in November of 2015 where it can receive up to 58.000 spectators for the games. Bordeaux - While Lyon has just started Bordeaux has made a great improvement. The earthworks, the foundations and the installation of cranes are all finished. Right now the stadium is under construction for the fabrication of benches. The project is expected to be delivered in April 2015 where the new stadium will have a capacity of 43.500 seats. Saint-Etienne - The renovation of Geoffroy Guichard keeps three main objectives in mind: respect the terms and conditions of the Euro 2016, reach a capacity of 40.000 seats and in the end provide the club with the tools for (further) development. This project finds itself in the last and third phase which concerns the rehabilitation of the tribune Pierre Faurand (south coast). It is expected to be delivered by June 2014 with indeed 40.830 seats. Marseille - The principal tasks at the Stadium Velodrome are to cover the stadium, increase its number of seats and redesign the surrounding area with a hotel, shopping centre and a museum. The estimated total cost of this project is 267 million Euros. When it opens in the summer of 2014 Velodrome will become the second biggest stadium in France due to an increase of 10.000 seats – 6.000 meant for VIP- to 67.000 seats. 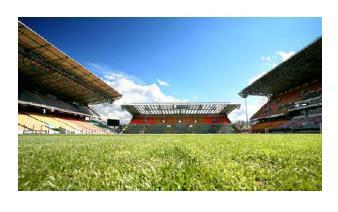 Toulouse - According to the renovation works at Stadium municipal de Toulouse that have started in June 2013 the number of seats will be reduced from 35.575 to 33.000 due to a lowered budget (60 million Euros). In return the spectators will benefit from more comfort and a better view. Regarding the delivery of the stadium by October 2015 this project consist of four phases concerning the reconfiguring around tribunes, installation of the new lawn, facade painting, new access controls and replacement of lighting. Lens - After renovation, Bollaert-Delelis will offer a seat to 35.000 people. This project concerns the renovation of the roofs, seats and new reception area for VIP, harmonization of facades, the redevelopment of courts and stands also an upgrade of the bathrooms. Lens will start the renovation works by January 2014 till the end of 2015. Paris - In contrary to the other stadiums, Parc des Princes in Paris is not going to expand its number of seats (48.500) for the UEFA 2016. Instead it is going to create a bigger welcome and more comfort. For instance improvement of VIP reception facilities, replacement of seats, installation of WI-FI, services for the general public (shops, snack bars), but also extend the players’ facilities and improve the working conditions for journalists. The works have started in May 2013 and the stadium is expected to be delivered one year before the Championship. To conclude, this shows real opportunities for suppliers of sport infrastructure. If you are interested in meeting VINCI and other important actors during our next mission in Amsterdam at the end of October, do not hesitate to contact us at Christelle Oliveira, Tel. +33 1 40 26 19 45 or christelle@transfer-lbc.com.